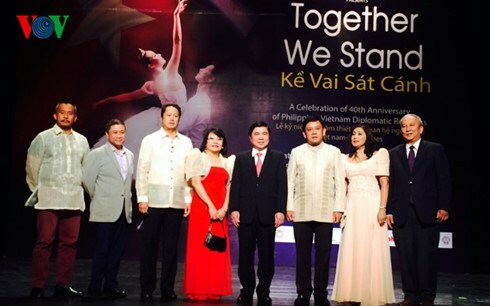 HCM City (VNA) – Friendship and cooperation between Vietnam and the Philippines were highlighted at a ceremony in Ho Chi Minh City on June 14, which aims to celebrate the 40th founding anniversary of diplomatic ties between the two nations. Addressing the event, Philippine Honorary Consul General in HCM City Le Thi Phung reviewed key milestones in the bilateral relationship, saying this has developed fruitfully in recent years, with promoted cooperation in all fields, especially food industry, pharmaceutical production, culture and education. In his speech, Chairman of the Municipal People’s Committee Nguyen Thanh Phong shared his joy at the fine development of the relationship, which was upgraded to a strategic partnership last year. Regular exchanges of visits between the two countries’ leaders reflected their efforts to foster bilateral activities, thus further promoting cooperation programmes, Phong stressed, adding that the enhanced political relations create momentum for cooperation in other fields. HCM City always takes the lead in carrying out cooperative programmes with the Philippines, contributing to strengthening the connection between the two nations, he noted. He expressed his belief that the Vietnam-Philippines relations will reach new achievements in various areas, bringing practical benefit to the two peoples. The Philippines has so far run over 60 investment projects in Vietnam, including 30 ones in HCM City.